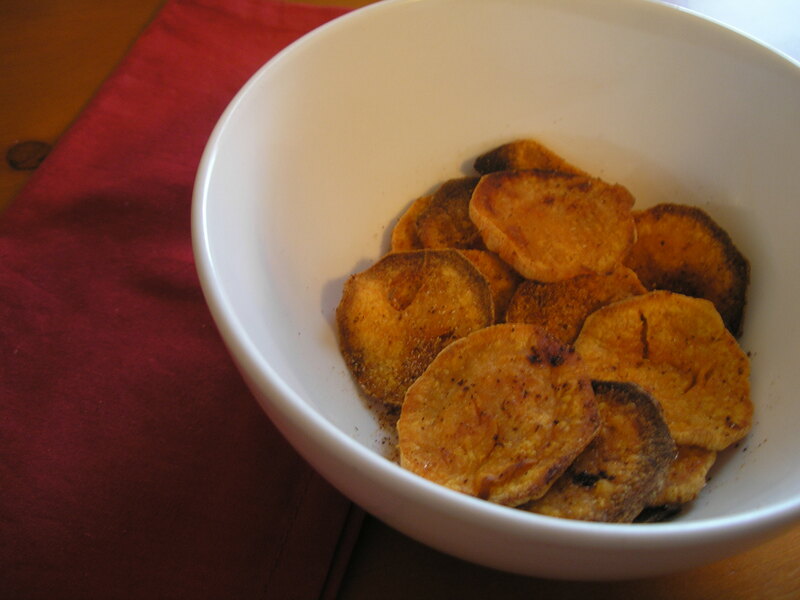 Baked Sweet Potato Chips - Eat. Drink. Love. I definitely woke up this morning with a case of the Mondays. Didn’t get enough sleep last night and I just wanted to be lazy all day long! But alas, to work I went and now it’s all dreary outside and it’s about to rain which means it’s time for a glass of wine, pajamas, and trashy reality shows. I had a couple of sweet potatoes stuffed in my pantry that I wanted to use up before they went bad, but I wanted to do something a little different with them. I decided to try my hand at making some seasoned baked sweet potato chips! They came out pretty good, but I realized one thing while making these puppies. I NEED A MANDOLINE! I tried to cut them as thin and evenly as possible, but of course that was an epic fail. Some did not get as browned and crispy, but they were still good. So, lesson learned folks. Use a mandoline while making these chips! 1. Preheat oven to 400 degrees. In a bowl combine sliced sweet potatoes and olive oil. Toss to coat evenly. Spray cookie sheet with cooking spray and layer potatoes evenly in a single layer. 2. Combine the rest of the ingredients in a bowl. Sprinkle about half of the mixture evenly over the potatoes. Bake for approximately 12-15 minutes. Flip and then cook for an additional 8-10 minutes*. Remove from pan and toss with remaining seasoning and serve! Notes: I recommend keeping an eye on these while they are cooking (especially after the flip). You don’t want them to burn and if they are sliced thin, they cook quickly. If some start to brown too much, remove them, and continue to cook the rest. You may find that your oven cooks more quickly or more slowly than mine and can adjust the cook time accordingly. I think it would make all the difference! The slices that were thinner and closer to 1/8″ thick were perfectly crispy, but some of the thicker slices were not, lol. Love this! Hubby bought us a mandoline that I haven’t use yet..so now I can finally use it! Did you find that they came our crispy? The potatoes that were sliced thin enough were perfectly crispy! These look crispy! Love that you could get that done with baking! Thanks, Erin! Most of them came out crispy and with the seasonings, they were really tasty! Thank you, Anne. These were definitely a rustic cut, LOL! Yum! I love sweet potatoes and the fact that these are baked! I need to get a mandoline and some sweet potatoes so I can make these! These sound amazing…and a mandolin would definitely make life easier! Thanks, Ann. I added a mandolin to my birthday list. Hopefully I will have one soon, haha! ooooh….birthday! When is your birthday? Hubby and I decided a LONG time ago when we were young and broke not to exchange presents…but I’d LOVE to change the rules and ask him for a DSLR! It’s September 17th. I think you definitely need to change the rules of the birthday gift thing!! I also told my husband that I want a DSLR. He laughed and told me the camera we have now is fine. SO CLUELESS HE IS! Yum, I am a big fan of snack food and I can see those being a permanent fixture in my house, thanks! I’ve tried making sweet potato chips without a mandolin, with a mandolin, baked and fried, but I never seem to get the texture right. Either they are soggy in the middle or burnt. However, your combination of seasonings sounds so good that I just might try it again the next time I pick up some sweet potatoes. Thanks for sharing! I can see what you mean, Alyssa. Some of mine that were sliced thin did start to burn a little bit. I tried to pull those out as the rest continued to cook. The only ones that were on the soggier side were the ones that were sliced too thick. Perhaps you are using too much oil? I’ve also read that a baking rack might be helpful for getting things like this to crisp up better! I love sweet potatoes! They are so much more healthy for you than regular potatoes chips -especially since you baked them. I also love the seasoning/spice mix you used. YUMMMMM! Great Recipe. Yum. This would be a great snack for me right now! Thanks, Victoria! It is definitely healthier and I really like baked chips! I love these and I didn’t have a mandolin when i made them too! so i agree, a mandolin would come in real handy! Thanks, Peachie. We need to get one! A mandoline is a truly invaluable kitchen friend but you do have to be so careful, more than one wound has been attributed to our little friend! Love these sweet potato chips, they would go so well with our burgers! Oh, knowing me, I would need to have a box of bandaids IN the kitchen ready to go, lol. Thank you, Peggy! I hope you like them! We love sweet potatoes, yours look so good! You are good at DIY!! I have to try it this weekend!! It looks delicious!! Haha! I try. I hope you like it! Love sweet potato and these sound great! I hear ya, Kita! Thanks! I love sweet potato! Yours look great! I must remember this recipe. I love potatoes and sweet potatoes even more. Never added cumin and paprika and my mouth water by just thinking of it. They look crunchy and just like how I want it! YUMMMMMYYYY! What a great way to use sweet potatoes – I often bake them and I think slicing them like this makes them quite crispy. I can’t think of a better snack! Yum! 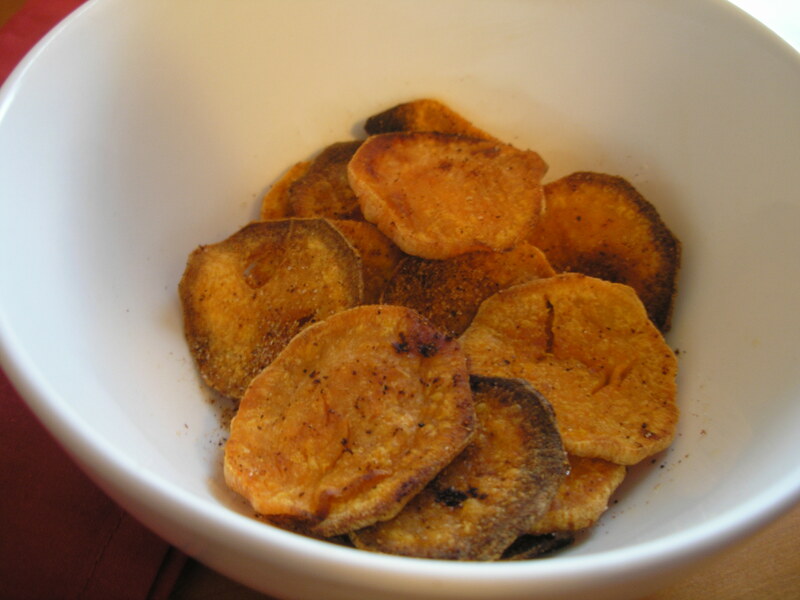 I love sweet potatoes any way they are prepared but these crispy chips sound divine :)!